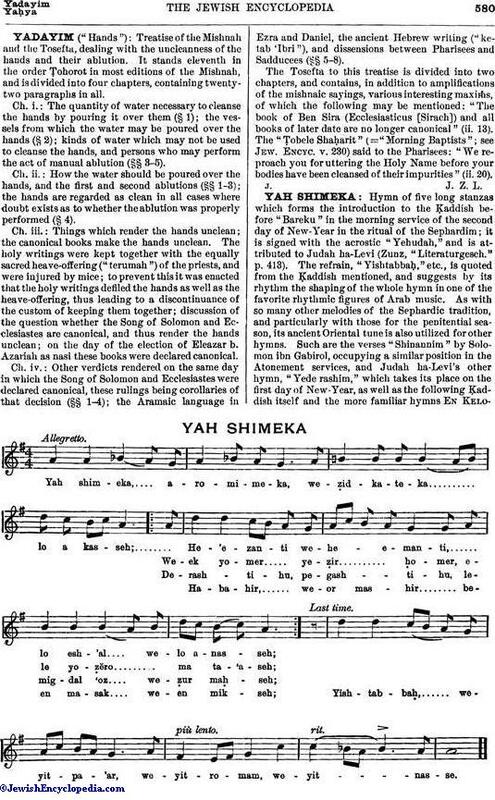 Hymn of five long stanzas which forms the introduction to the Ḳaddish before "Bareku" in the morning service of the second day of New-Year in the ritual of the Sephardim; it is signed with the acrostic "Yehudah," and is attributed to Judah ha-Levi (Zunz, "Literaturgesch." p. 413). 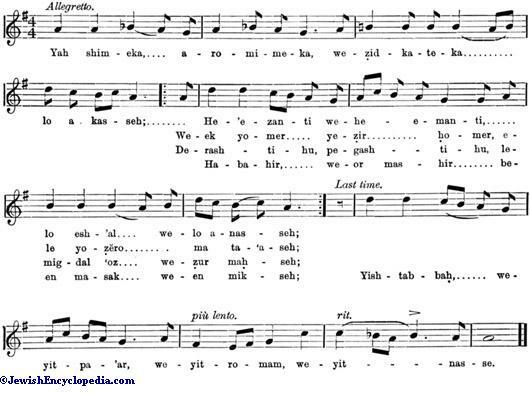 The refrain, "Yishtabbaḥ," etc., is quoted from the Ḳaddish mentioned, and suggests by its rhythm the shaping of the whole hymn in one of the favorite rhythmic figures of Arab music. As with so many other melodies of the Sephardic tradition, and particularly with those for the penitential season, its ancient Oriental tune is also utilized for other hymns. 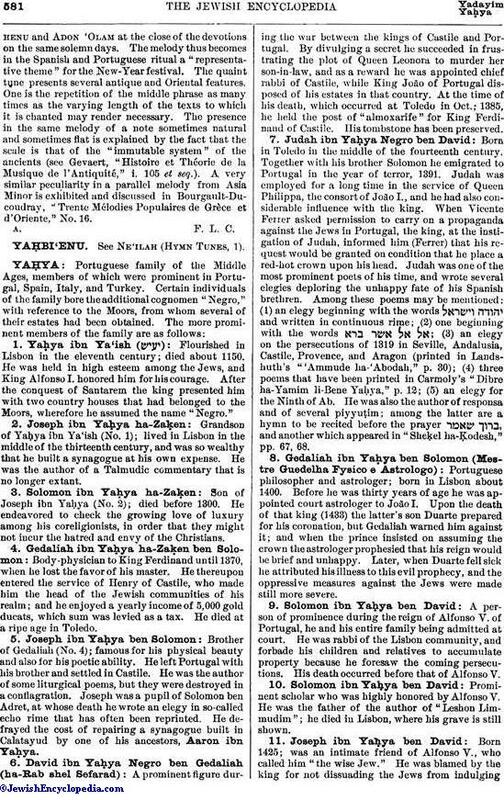 Such are the verses "Shinannim" by Solomon ibn Gabirol, occupying a similar position in the Atonement services, and Judah ha-Levi's other hymn, "Yede rashim," which takes its place on the first day of New-Year, as well as the following Ḳaddish itself and the more familiar hymns En Kelohenuand Adon 'Olam at the close of the devotions on the same solemn days. The melody thus becomes in the Spanish and Portuguese ritual a "representative theme" for the New-Year festival. The quaint tune presents several antique and Oriental features. One is the repetition of the middle phrase as many times as the varying length of the texts to which it is chanted may render necessary. The presence in the same melody of a note sometimes natural and sometimes flat is explained by the fact that the scale is that of the "immutable system" of the ancients (see Gevaert, "Histoire et Théorie de la Musique de l'Antiquité," i. 105 et seq.). A very similar peculiarity in a parallel melody from Asia Minor is exhibited and discussed in Bourgault-Ducoudray, "Trente Mélodies Populaires de Grèce et d'Oriente," No. 16.